With a mortar and pestle, mix together salt, sugar, 2 teaspoons coriander seeds, and pepper. Place salmon fillet in a large baking dish, skin-side down and rub salt mixture all over the flesh side of salmon. Cover with plastic wrap, add a weight, and cover the entire dish with plastic wrap, and refrigerate for 24 hours. Combine the mustards, sugar and vinegar in the bowl of a food processor fitted with a metal blade. Process to combine, then add the oil drop by drop until the mixture is thick. Wipe off salt mixture from salmon and rinse under cold water; pat dry and return to a clean baking dish skin-side down. 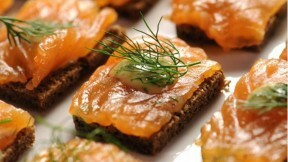 Drizzle salmon with olive oil and vodka and sprinkle with dill and remaining 2 teaspoons coriander seeds. Cover, weigh down, and refrigerate for 24 hours. Remove salmon from refrigerator and wipe off excess marinade (reserving dill for garnish). Slice salmon into 1/4-inch thick slices, removing skin; keep refrigerated until ready to serve. Serve on bread, topped with Mustard sauce and reserved dill.